Clos Windsbuhl is one of the jewels of Zind-Humbrechts crown. It is located high above Hunawihr, next to the forest edge and along the bike path that connects Hunawihr with Riquewihr. The micro climate is cool, and the bedrock is is pure limestone, muschelkalk. Here the grapes ripen slowly, and regardless of whether the grape is Riesling, Gewurztraminer or Pinot Gris, the wines has exemplary acid, complexity and structure. But why have the wine sold in Sweden to 50% of the price for direct sales at the winery? 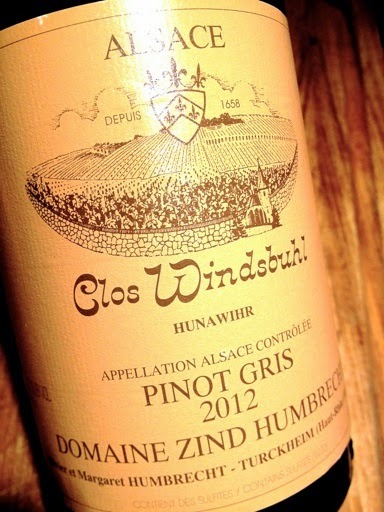 2012 Pinot Gris Clos Windsbuhl from Zind-Humbrecht in Turckheim has a fairly light, greenish-yellow color. The aroma is complex and delicious with almonds, white raisins, pineapple, honey, and a clean and pleasing tone of forest mushrooms. The 43-year-old vines provides a deep and dense palate with fresh and high acidity, fine tannins, a hint of bitterness and prefect balance despite 36.5 grams of residual sugar per liter. Price (2014): €46 (but 239 SEK in Sweden).